"I have a feeling that there is just about one more good flight left in my system, and I hope this trip is it. " 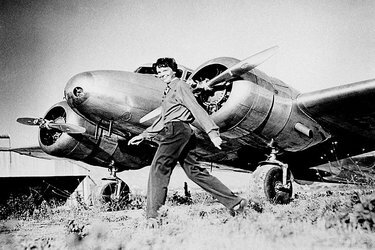 The Amelia Earhart mystery has perplexed researchers and other individuals since the late 1930s, when she took what is known today as her “Final Flight”. The Amelia Earhart disappearance is considered to be one of the greatest unsolved mysteries in aviation of all time. Born on the 24th day of June in the year of 1897 as “Amelia Mary Earhart” in the City of Atchison in Kansas, the little girl was raised in what individuals described at the time as “Unconventional”. Her mother, Amy, did not look favorably upon raising her girls in the same manner that other parents raised their girls. 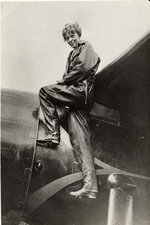 She and her younger sister, Grace Muriel Earhart, were encouraged to engage in activities that they were interested in and strongly encouraged to be themselves. Many believe that this strong influence and knowledge about the Amelia Earhart history is what led to the child’s spirit of play and adventure throughout life. In studying the Amelia Earhart mystery, it is important to review the temporary family split that occurred when her father, Edwin, had to transfer to the City of Des Moines in Iowa. He worked as an officer that handled Claims for the company known as the “Rock Island Railroad”. The transfer occurred in the year of 1907. Based on the Amelia Earhart history, we know that she and her sister remained with their grandparents in the City of Atchison. Their parents wanted to focus on the move and get the home situated for the children. It was during this time that the girls were educated at home. In the year of 1908, Amelia observed her first air vessel. It was at the State Fair that was located in Des Moines. At this time, she was not at all interested in the aircraft and showed a greater interest in other structures at the fair, such as the Merry-Go-Round. In the year of 1909, the temporary family split came to an end and the family was reunited. It was at this time that Amelia and her sister entered public school and she realized that she had a passion for reading. In reviewing Amelia Earhart history and the Amelia Earhart mystery, in general, it is essential to learn about the devastation and despair that the young woman experienced as a teenager. As time progressed, Amelia’s father was able to reach a point of financial stability. He purchased a new home for the family and was even in a position where he could hire individuals to assist in the day to day responsibilities of the home. Unfortunately, the new found fortune led to an alcohol addiction in Edwin. By the year of 1914, the company that he worked for forced the man to retire from his position. While numerous attempts to get himself sober were made, Edwin Earhart was not permitted to return to his position as the Claims Officer for the railroad company that he was previously employed by and that impacted the family’s finances negatively. To further complicate the issues that were occurring with the Earhart family, Amelia’s grandmother, Amelia Otis, passed away unexpectedly. When she died, she left behind a large estate. Unfortunately, she feared, in life, that should her daughter – Amelia’s mother, Amy – acquire the fortune from the estate that her husband’s addiction would severely drain the money associated with the estate. For this reason, she placed a share in a special trust fund designated for Amy. However, in reviewing the Amelia Earhart mystery, we have found that her grandmother’s home that was left behind, as well as all of the cherished valuables in the home, was auctioned immediately after her passing. In later years, Amelia Earhart would often describe this chain of events as the official cessation of her adventurous childhood. 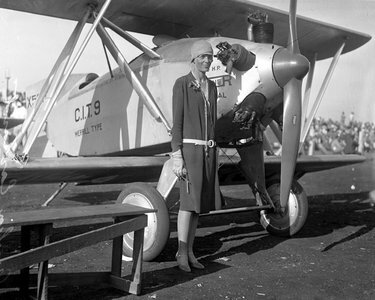 Individuals that are interested in the Amelia Earhart mystery often have an interest in the early flight experiences that she had. On the 28th day of December in the year of 1920, she and her father visited an airfield. A pilot by the name of Frank Hawks allowed her to ride in his airplane with him and that marked the beginning of an intense interest in flying. It took Amelia working long hours at a variety of jobs to earn the initial one thousand dollars required for her flying lessons. It was at the time that she started flying that her transition started to occur so that she would gain the respect of other pilots – who, at the time, were mostly men. According to Amelia Earhart history, it was at this time that she cut her hair exceptionally short and slept in her flying jacket for several days in order to make it look worn like those of the male pilots of her time. On the 2nd day of July in the year of 1937, the female pilot took off on a flight that would lead to the ever-popular Amelia Earhart Mystery. She, and another individual referred to as “Noonan” took off at 0000 GMT from a region known as Lae. The destination that the two wanted to reach was the Howard Island. It was an amazing 2,556 miles away from their take off point. Approximately 800 miles into the flight, Amelia and Noonan were located over the Nukumanu Islands. In relation to the Amelia Earhart disappearance, this would be noted as their last positive report as well as the last sighting associated with that tragic flight. The U.S Coast Guard had a vessel stationed near the intended destination called the “Itasca” that was meant to communicate with the flight. However, the individuals on the vessel established that Amelia and Noonan did not understand how to effectively communicate via the radio navigation unit onboard their flight. It was noted that both the reception and the quality associated with the documented reception was extremely low. There were a total of six hours of communication before it was completely lost. This was the first event to transpire in the Amelia Earhart mystery that has plagued researchers throughout history. It was at this time that the official Amelia Earhart disappearance became evident. Despite numerous attempts by the Navy and the Coast Guard, the flight was never found. Today, many speculations and rumors abound about the Amelia Earhart mystery. None of these speculations or rumors has yet been validated. However, the Amelia Earhart disappearance is certainly considered one of the greatest unsolved mysteries of all time.